The Reederei Riedel GmbH celebrated its 45th anniversary on July 15th 2016, and therefore is looking back at a long and proud business history. At present the Reederei Riedel GmbH is the second largest passenger shipping company of Berlin and at the same time Germany’s most sustainable and cleanest one. We are partner of the “Berlin Highlights” ~ an association of currently 12 tourist attractions of the metropolis Berlin. This partnership allows us to offer our guests an attractive bonus-system. Our fleet includes 15 passenger ships, where our guests’ everyday have the opportunity to explore Berlin from the waterside by boat ~ food and beverages are always available aboard, since each of our ships possesses an onboard kitchen. 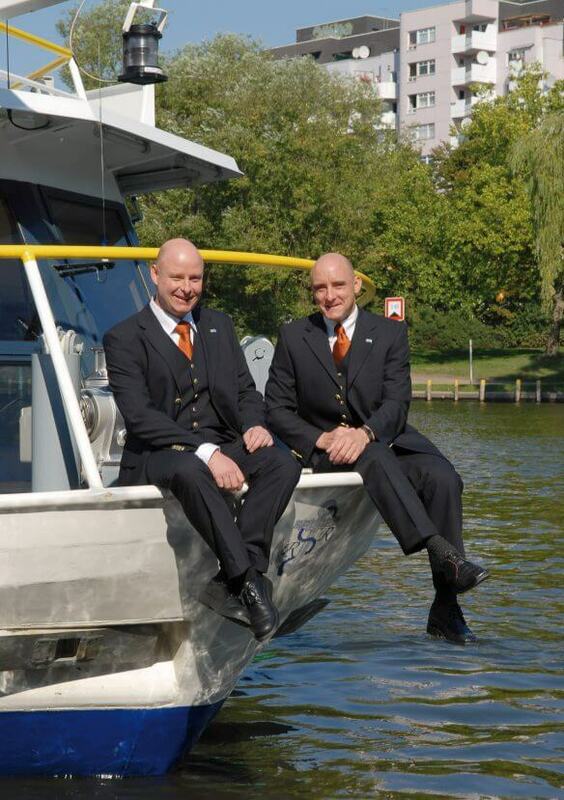 In addition, special events take place regularly aboard of our ships, which can also lead beyond Berlin’s inner city. These include for example „Aquarella Berlin“, „Magical Fire on the Müggelsee“, „Icke in Berlin“, „Enlightened Berlin“ or „krimimobil“. For those guests, who are travelling in larger groups and would like to be undisturbed aboard, or those who would like to celebrate their festivities aboard, there is the possibility to charter one of our 15 ships. For those who are not brave enough to venture „on the high seas“, may take care of your culinary- and physical well-being in one of our two restaurants: aboard our café-ship “Spree-Blick”, our guests can enjoy a quiet view of the Spree, while enjoying delicious homemade meals and coffee specialities. The „East-Side-Blick“ provides a unique view of one of Berlin’s most famous sights in Berlin, the „East Side Gallery“. For this reason grand organizers of the Berlin art-, culture- and tourism scene have been united to ensure that your visit to Berlin is as convenient and exciting as possible. With this Berlin Guide you are our VIP guest in Berlin. You will find all the BERLIN HIGHLIGHTS and places of interest. The BERLIN HIGHLIGHTS-bonus offers an extra that you would otherwise have had to pay for – a sparkling glass of Prosecco or an informative audio-guide. When one lives and works in Berlin, one is automatically in a varied and innovative environment. We have a long standing and successful cooperation with some companies from this innovative environment, we are partners. We would like you to benefit from our “Network Berlin”, therefore we offer you discounts with our partners, which are all linked to our ship tours.